I live near Toohey Forest, Brisbane and often walk through there, enjoying nature. There are some city folk take advantage of the natural bushland – we are so lucky to enjoy city and bush. 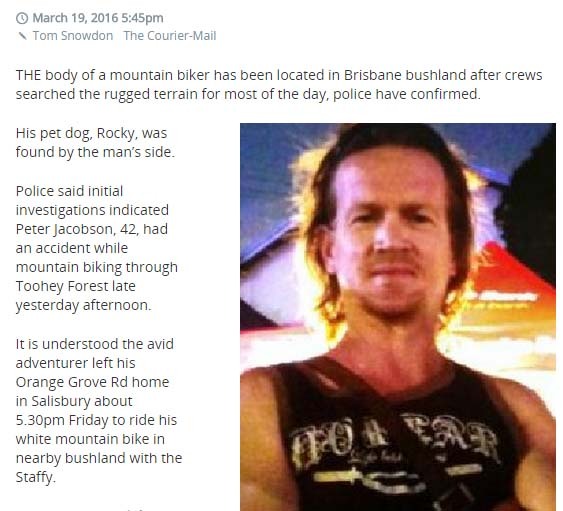 But yesterday news a man on his bike with his dog reported missing 11 pm when he didnt return home. Searchers found his body today 4 pm, with his dog by his side. As a virtual neighbor my head spun. I visited his facebook. He loved mountain bike riding. He had just bought Gopro to record riding. He tried recording a boy racing in the forest. His facebook expressed hurt for kids in broken marriage. He had many posts loving nature. He was a neighbor kind of and I never knew. God gives good students an early mark.